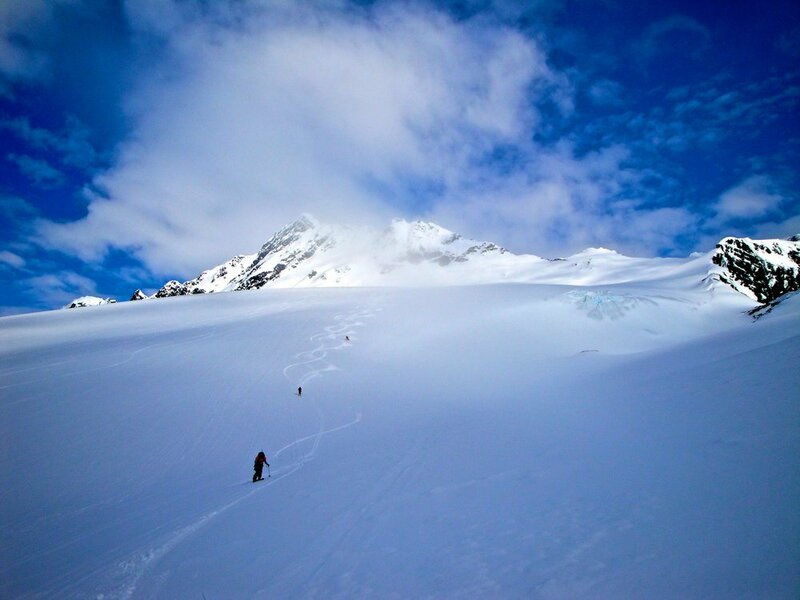 Valdez skiing in the Chugach Range of Alaska has some of the most accessible glaciated ski mountaineering terrain in North America. Powder runs, couloirs and wide open glaciers await the ski mountaineer. 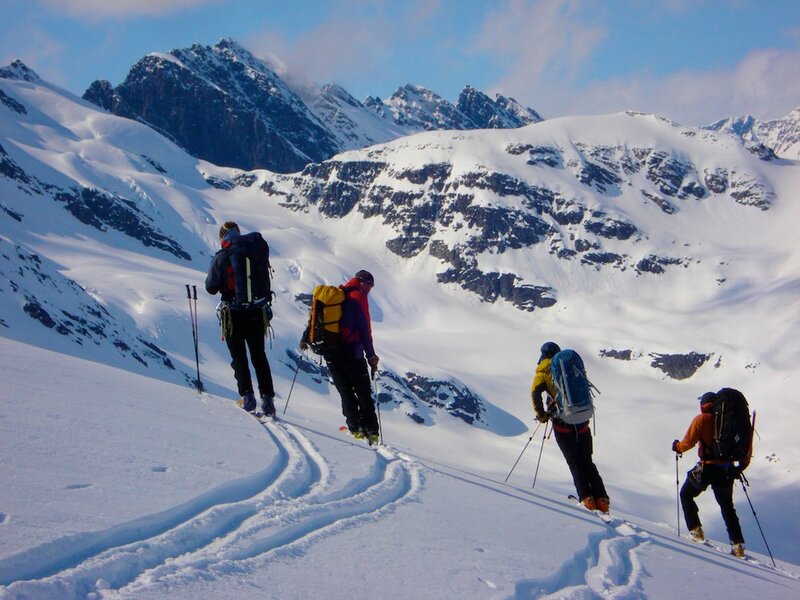 While skiing in Valdez, you will find ski touring terrain for every level of advanced skier, it's not just all about the extreme steep skiing that Valdez is famous for...but of course there is that also! 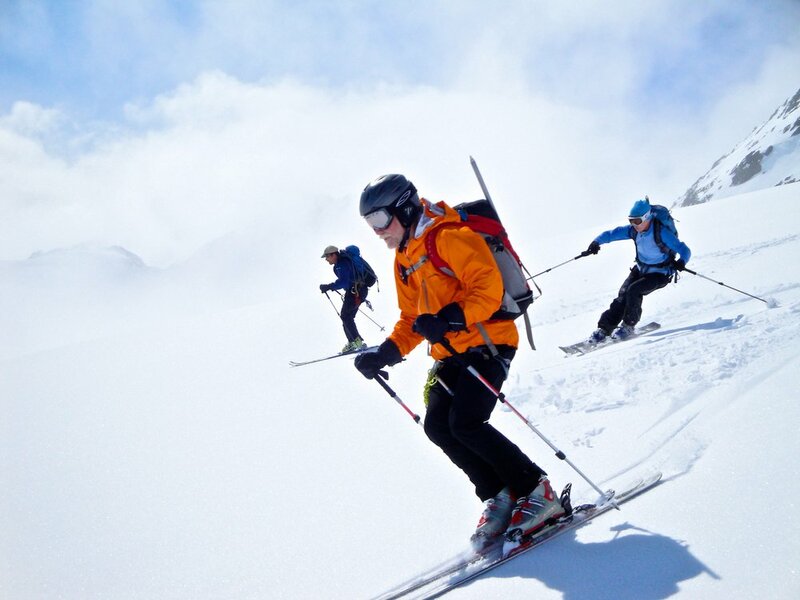 In six days of ski mountaineering and ski touring, we get in a lot of Valdez skiing. 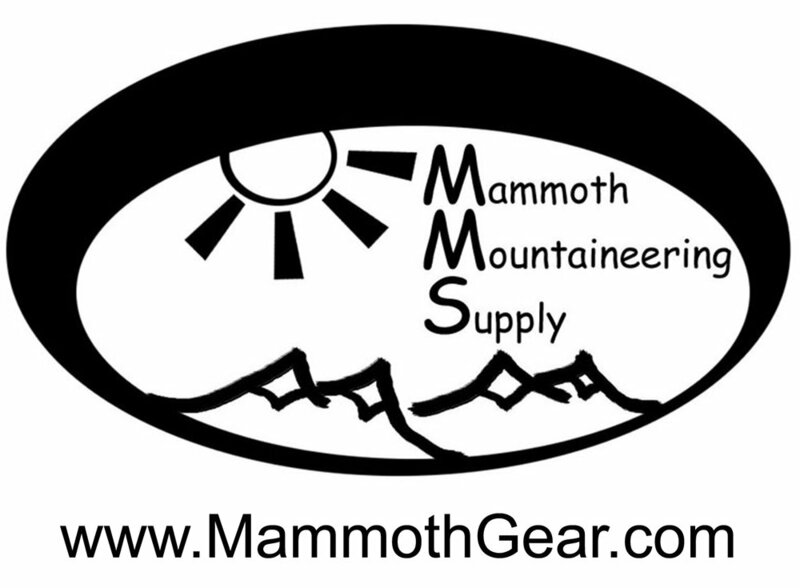 We also plan on two helicopter "bumps" to get us quickly into some of the more remote ski terrain. The combination of ski touring and heli-touring makes for a great big-mountain Alaskan ski mountaineering experience at a fraction of the cost of heli-only Valdez skiing. And you do earn most of your turns! Nights are spent in the comfort of a local lodge in the port town of Valdez. Most of our Valdez ski tours are out of the Thompson Pass area, not far from town. Thompson Pass is unique in that it is one of the only areas in the United States that offers roadside access to big glaciated ski terrain. Another great feature of this trip is that even in poor weather, we still may have good skiing options...something the heli-only skiers do not have. No sitting around in Valdez waiting for the skies to clear!mWe also cover some skills practice in ski mountaineering techniques, but mostly it is all about getting in some amazing skiing in famous Chugach powder for which Valdez is famous. Our Valdez ski trips are led my IFMGA/UAIGM internationally certifed ski mountaineering guides with extensive experience in the Valdez area. Advanced level split-boarders are suitable for this trip! "When we first planned the Valdez ski trip we hoped it would be the "trip of a lifetime" and I can now honestly say it was. So thanks again for organizing such a memorable week" - Sarah P.
On the Valdez skiing trip we recommend advanced level skiers with at least some previous backcountry skiing experience. You should be comfortable skiing black diamond runs at a resort in most any condition. Very good physical condition required. We provide private van transport within the Valdez area. Lodging is provided at double occupancy in 3 star accommodation in the cozy port town of Valdez. Dinners in town are not included but we will visit local restaurants each evening. Skiing off of Thompson Pass near Valdez. Exact routes will be determined according to conditions, group strengths and goals, etc. We will attempt to get in two heli-bumps as well as some ski mountaineering training such as crevasse rescue on skis. Final day of skiing in Valdez. It is possible to catch a late afternoon flight out of Valdez or choose to spend another night in town.